American Churchmen Sight-seeing in Moscow [March 14, 1956], from RT 1040, Religious News Service photos, #18880. And, this is the kind of thing that I don't know whether I want to leave in. I was offered -- eagerly -- secret mics for recording crucial conversations or any conversations that I would like with an adequate supply of tapes. And, I declined. And, said that even though they told me that this would be happening on the other side. I said I don't care. We've got enough on our hands. And, I don't want to be distracted by carrying these gadgets -- Wasn't worth it! -- around. And, I wanted to be what it appears to be. And, I don't want to do it. All right. It is up to you. And that was from our government? That is from our government. The CIA wanted me to do it. Blake's recollection conflicts with other published accounts of the trip, and affords us a view of Allen Dulles, Director of Central Intelligence, undermining the work of his brother, John Foster Dulles, Secretary of State. R. Douglas Brackenridge, writing in the Journal of Presbyterian History in 1990, notes that Blake understood the political sensitivity of the proposed trip, and writes that in a 9 June 1955 letter, Blake asked John Foster Dulles, himself a Presbyterian, for pre-clearance of the NCC delegation. Dulles asked for a detailed itinerary, and Brackenridge writes: "Dulles later voiced no objection to the Moscow visit nor to a reciprocal visit of Russian clergymen to the United States. State Department officials briefed the NCC delegation before it departed but otherwise did not participate either in the structure or content of the Moscow conversations." "Young man! That is nonsense. I know more about these Orthodox than you'll ever know. I've been in and out of more beards than you'll ever see. That's enough!" 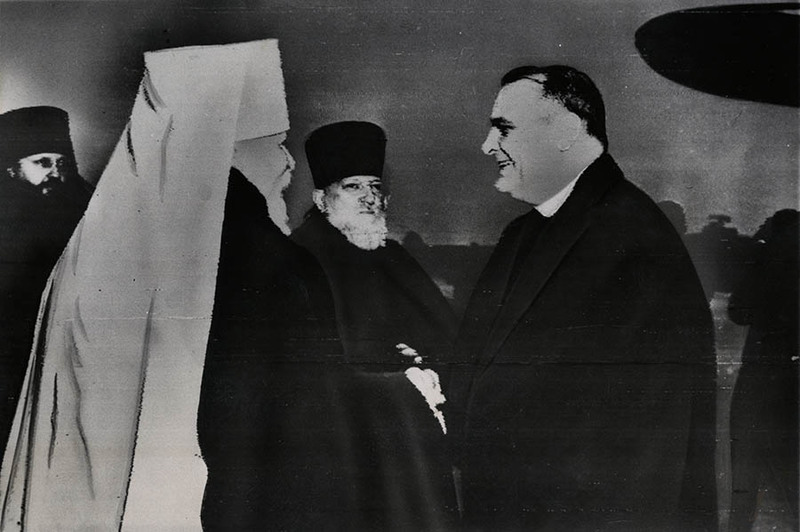 Eugene Carson Blake greeted by Metropolitan Nikolai, March 13, 1956. From RT 1040, Religious News Service photos, #18875. Nicolai : As regards Korea and Indo-China, any statements that were issued were put out for the cause of peace. Sherrill: But you should tell the truth! Nicolai: There has been heat at times and periods of tensions. There might be such statements which could be annulled. Blake: In the Christian spirit they might be forgiven, but they cannot be annulled! The NCC delegation to Moscow. Left to right, front row: D. Ward Nichols, Henry Knox Sherrill, Eugene Carson Blake, Charles Parlin. Back row: Walter Van Kirk, Herbert Gezork, Roswell Barnes, Franklin Clark Fry, Paul B. Anderson. From RT 1040, Religious News Service photos, #18844. 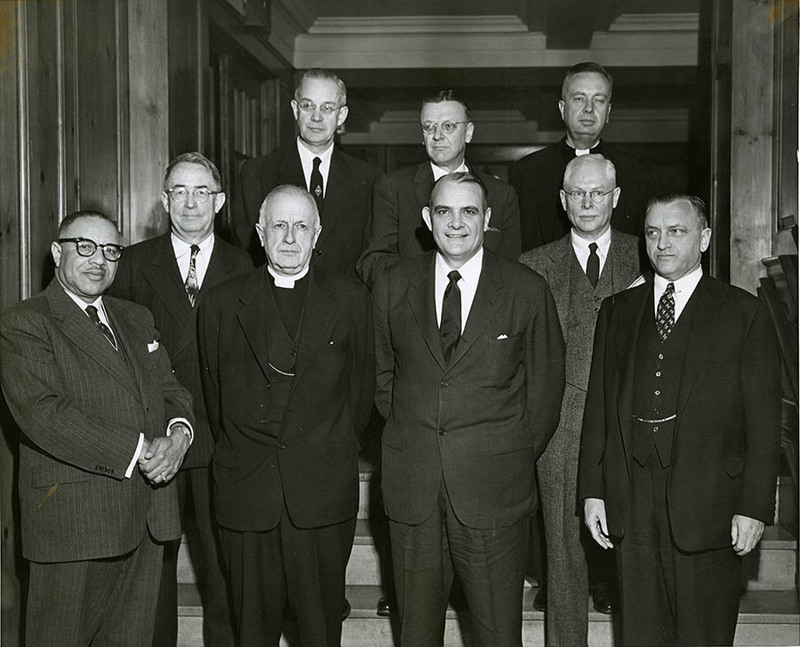 The delegation also visited Russian dissenters, among them Baptists and Lutherans, and toured an art gallery, establishing the bonds which would lead ultimately to the Russian Orthodox Church joining the World Council of Churches in 1961. For his part, Blake came home from Moscow convinced that one of the ironies of the ideological conflict between East and West was that the Christian West promoted an economic system capable of guaranteeing material prosperity, whereas the dialectical materialists of the East promoted immaterial assets: peace and justice. Though a climate of paranoia undergirded the trip -- the delegation knew it was subject to surveillance by the KGB -- it was cut through with moments of levity. The delegation's photographer, Charlie Parlin, paused during a walk across Red Square to take a picture of Lenin's Tomb, thought twice about it, suddenly saw a Kremlin guard running towards him, and was convinced the guard would confiscate the camera, when, to his surprise, the guard pointed to Parlin's lens: the cap was still on.